Peel and grate the potatoes using the thick side of a box grater or your food processor’s grating attachment.Use your hands to squeeze as much moisture from the potatoes as possible (the more moisture you remove the crunchier they will be when cooked) and pop into a mixing bowl with the herbs. Season well with S&P and stir to combine. Heat a medium non stick frying pan over medium heat for a couple of minutes. Add 1 tbs oil and allow to get hot. Next to your stove lay a couple of pieces of paper towel on the bench. Place a cake rack over the top – this will be used to drain the hash browns once cooked. Place around 2tbs of potato mix into the pan and use an egg slide to flatten to desired thickness. Cook until golden brown and then carefully turn over and repeat with other side. Remove from pan and place on a cake rack. Repeat with remaining mixture and serve with your choice of breakkie sides like eggs, bacon, tomatoes, mushies, spinach and smoked salmon. 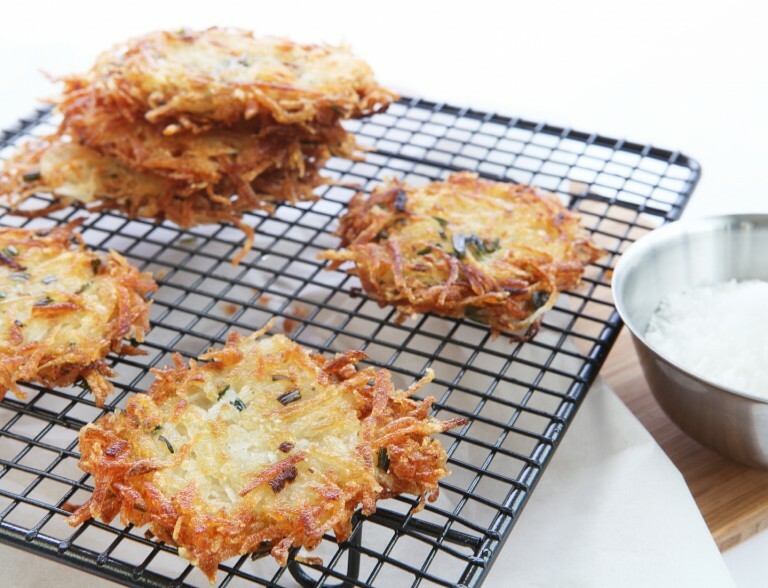 Tip: if the cooking process might take you a while preheat your oven to about 150 degrees and place the cooked hashbrowns in a tray to keep warm as you cook. *if serving with smoked salmon add the zest of a lemon to the mix for some extra zing.